Customer's Request: I wanted to grow some artichoke plants this year, but recently read that they can be very invasive in some places. Do you think this will be a problem in my region? Additionally, besides the part of the plant we usually eat, the flower bud and bit of stem, are there any other parts that are edible? 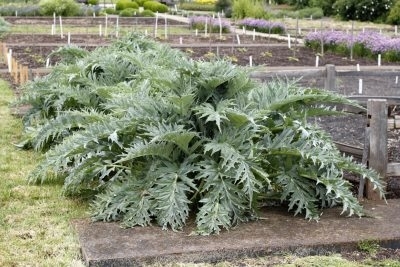 Specifically, is the foliage of the artichoke plant itself edible at all? Thank You. While closely related to the artichoke thistle, edible artichokes are a different variety. 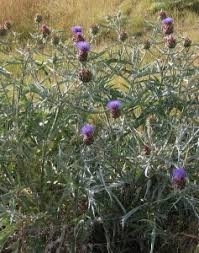 Invasive artichoke thistles spread by seed. Edible artichokes don't have a chance to make seeds because you eat the flower. You also asked if other parts of the plant are edible. While the leaves and stems of the artichoke plant could be eaten, the leaves are very prickly and the stems are very tough. We grow them just for the very tasty immature flowers. Many people include several inches of the stem when they harvest artichokes. Unless the artichokes are very young, the stems will probably need to be peeled to be edible, but they can be a nice extension of the tasty heart. Cardoon, a variety of the artichoke thistle, is grown for its edible stems (and even these can be tough), but has the possibility of escaping because its small and the spiny flowers are not eaten and the seed can disperse to other locations. Artichokes are fun to grow, and do well in the cooler parts of Contra Costa County and with some consideration of appropriate planting location and water can grow in warmer areas. 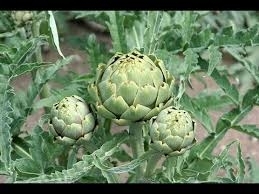 This following link will take you to further information from the University of California about growing artichokes: http://ipm.ucanr.edu/PMG/GARDEN/VEGES/artichokes.html.